► DRAW or TAKE NOTES: The most affordable tablet that comes with a pen and a pre-installed Autodesk Sketchbook app for those who want to draw pictures or take notes in the classroom. ► 3 FREE BONUS ITEMS inside the box: a high-quality tablet case, universal power adaptor and pre-installed screen protector; a total value of $40 inside the box along with 10-inch tablet and an active Pen. ► CLEAR SCREEN, LARGE DISK and a SUPERIOR CPU: The High power MediaTek Quad-core processor boosts the multitasking abilities of the tablet. The IPS HD screen resolution makes crystal clear pictures and the 32GB disk allows you to download thousands of free apps from the Google play store. ► CONNECTIVITY: Connect your tablet to your home WIFI network and you can take this tablet wherever you are; your entertainment always goes with you. Link your tablet to the TV via the micro HDMI port and view your movies on the large screen. 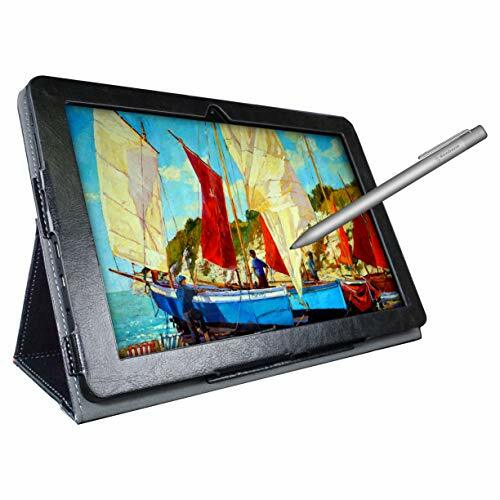 One of the best tablets for watching movies on Netflix, playing games and browsing the internet. GPS and the USB type-c port provides all the connectivity options you want. ► CERTIFIED QUALITY and WORRY-FREE PURCHASE: Certification by Google, FCC and CE standards provides you the peace of mind for safety as well as quality. Comes with 1-year warranty, along with best customer service our support staff can provide. You can contact us for any questions that you may have. If you have any questions about this product by Simbans, contact us by completing and submitting the form below. If you are looking for a specif part number, please include it with your message.